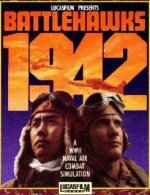 BattleHawks 1942 was published by LucasFilm Games for PC DOS in 1988. Greg Ingram reported from his archives: "It was the precursor to Battle of Britain - Their Finest Hour and was one of the first games produced by Lawrence Holland. The game was based on WW2 carrier battles in the pacific. It featured a series of fixed scenarios and did not have a campaign. Over all it was a very good game."